The Alfa Romeo Giulia Quadrifoglio is a perfect car in my dreams. In this perfect dream world, Alfa claims the Quadrifoglio boasts 505 horsepower from its twin-turbo V6 and max torque of 443 lb-ft out of the box. But how does it hold up in the real world? 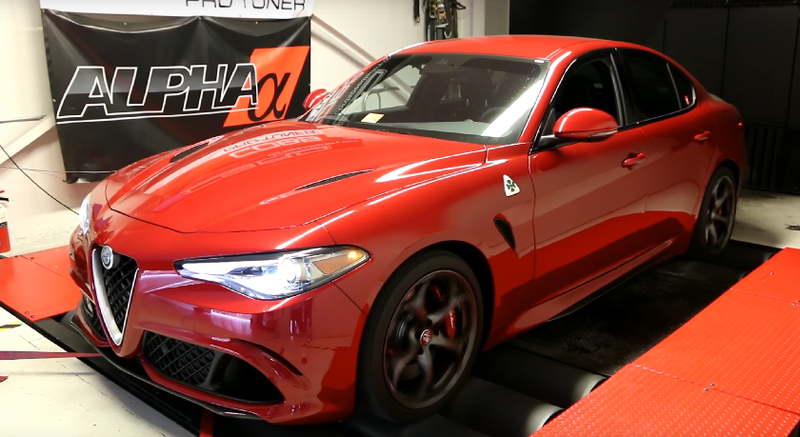 In the fifth installment of the “Owning an Alfa Romeo Giulia Quadrifoglio” series on the AutoAvanti YouTube channel, the car gets a reality check with a dyno test. According to the Mustang dynamometer results, which the uploader insists consistently provides conservative figures, the Giulia Quadrioglio’s horsepower was measured at 392 HP and the torque at 389 lb-ft at the wheels—lower than the crank claim from Alfa, and quite a bit less than its competitor the BMW M3 makes at the wheels. Those figures show a 22 percent difference in horsepower and a 12 percent difference in torque over the manufacturer claims, which seems pretty normal. But if the dyno is known to give a conservative rating, it may be safe to assume there may a little more power available than what’s shown here. The car also had to be tested on a four-roller setup because otherwise the test didn’t work. For comparison, when Matt Farah tested his new, pre-tuned Focus RS on a similar Mustang dyno, the results showed an eight percent difference in horsepower and virtually no difference in torque from Ford’s claimed specs. So, does this one dyno test seem a little low? Yeah, it does seem kind of low. I guess we’ll all just have to get Alfa Romeo Giulia Quadrifoglios and test them ourselves. This post has been updated to make the results a little more clear.